They’re thinking about bunnies and chocolate, maybe a new outfit and brunch at a restaurant. Despite what the stores may want you to believe, Easter is not about any of that stuff. It’s about hope beyond the grave. You take that hope out of Easter, and Easter is just another Sunday...and life ends with death. Can you be as certain as Job? Is it possible to know that after death you will rise to meet your Redeemer face-to-face? The answer is yes...because of Easter! “Christ has been raised from the dead,” Paul declared. “He is the first of a great harvest of all who have died” (1 Corinthians 15:20). At death, the soul separates from the body, and the body is placed in a grave, either in a casket or as ashes in an urn. Either way, our bodies decay into dust, but that isn’t the end. Christ was raised from the dead and later ascended into heaven. He has promised that He is coming back to earth...and when He returns, He will lift from the grave all of those who have died. “When the trumpet sounds, those who have died will be raised to live forever,” Paul writes triumphantly (15:52). How good is that? When I’m officiating a graveside service, as the people are standing together under the tent beside the open grave, I always say, “You may not realize it, but you’re standing on resurrection ground.” I love to watch what happens. Some people take a little step sideways, as if they’re going to block something that’s about to happen underneath them! Of course, the ground doesn’t shift right then. But the fact is, someday, our bodies will be raised from the grave and be instantly changed—made ageless and timeless, free of any further fear of death. From then on, our bodies will last eternally just like the body of Jesus when He was raised. It’s all part of “the harvest.” How can I be so sure? Easter! What a great promise! 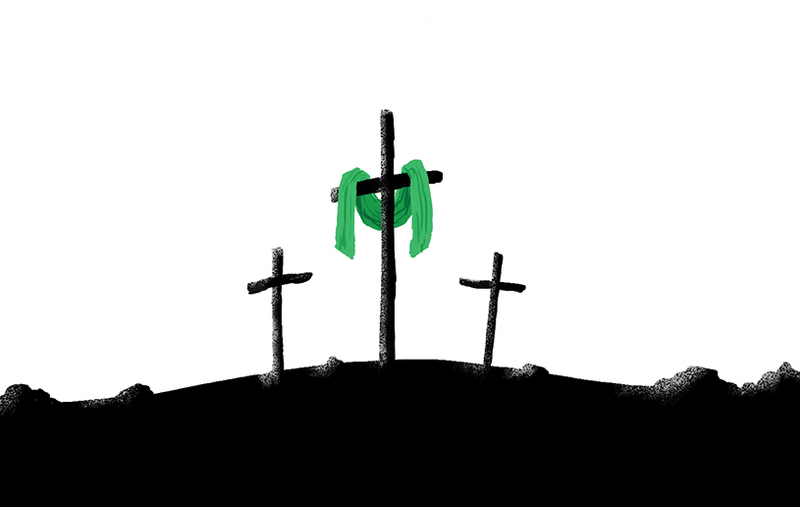 Everything hangs on the hope of Easter. Let her words sink in. If there’s no hope, there’s no spring. But because there IS hope, the winter you’re enduring will end. You can count on it! The new life of spring will come! Not even death will separate us from our beloved loved ones forever. We will be reunited. There will be no more tears, no more sorrow! Pain will disappear. Heartache and despair will be no more. Evil will be destroyed. The darkness will be dispelled once and for all. We will live together in the light of our Saviour, singing His praises in our resurrected bodies forever! You know why? You know why we have such glorious hope? Because Easter is the biggest promise of all! Christ is risen! He is risen indeed.